Sometimes you have to put off spontaneity. Like the time I rounded a corner and there was the most amazing rocky river and around the next bend was an overgrown, abandoned rail bridge. The timing was off and there was no way we could stop, but that damn bridge wouldn’t leave my head. The next morning at our Airbnb, which we’d made a disaster of dishes and laundry, Melani did one of those things that keeps us together after so many years: She gave me a pass and told Trevor and I to go find that damn bridge. We knew it was about 20 minutes back up the road, but we couldn’t remember exactly where. Our perspective was off, nothing looked right, and we knew for sure we’d gone too far when we came to the community hall in Anson. Then there it was. The Carrabassett River was smooth and glassy on one side of the highway bridge, but showed a completely different face when approached from the south. Fast-running water rushed over hundreds of small boulders, sounding like static and looking like oblivion, pooling in basins that were deceptively calm. And there — crossing this menacing, narrow river — were symmetrical rusty lines against the bluest sky. We pulled off the road directly across from the mouth of the bridge. There used to be rail where I parked the truck, but it was paved over sometime in the late ’70s, when the bridge was abandoned. Beyond the static of the river below, the town was Sunday-morning silent. We stepped onto rail, and bounced lightly on a couple of the crossties. They were dark and veined and gave slightly under our weight. There were places farther ahead where plywood was nailed over ties to cover spots where it was rotted through. Before this iron span was built, there was a covered rail bridge here, erected in 1888. There are marvelous pictures of it, and more modern ones, in a book by the Anson Bicentennial Committee. That bridge, not as impressive as this beast, was tough enough to withstand a tornado, if a letter to the editor in an 1890 edition of Engineering News is to be believed. Mr. Thompson referred to peculiarities in the bridge’s architecture and noted that iron plates on the structure had slipped. “After the storm,” Mr. Thompson wrote, “the ends of each span were in place but their centers had been sprung about 18ins out of line so that the track formed a series of reverse curves while the top of the bridge roof and all was tipped so that the trusses were at least 4 ft out of plumb.” However, damage was quickly repaired and trains were running the next day. On our clear day, we started a slow unsteady walk across. Trevor kept to the centre, close to the rail, while I walked on the outside edge because I could see thick reinforcement beams under the ties. The wood was spongy and invited caution. This bridge was built 109 years ago. The Somerset, Maine Central, and Pan Am railroads carried lumber, agricultural goods and people over the Carrabassett to the end of the line here at North Anson. Locomotives that had roared across the track upon which we walked so gingerly were named things like Black Dinah, Moxie, and Bombazeen. Just past the halfway point was a strange metal beast we have since learned is a buffer stop, meant to prevent locomotives from rolling farther down the end of the track. It wouldn’t stop more than ghost trains now, but it stood at attention, cool metal under a hot sun, unshaded at the centre of the bridge where even the most hardy of weeds haven’t ventured yet. 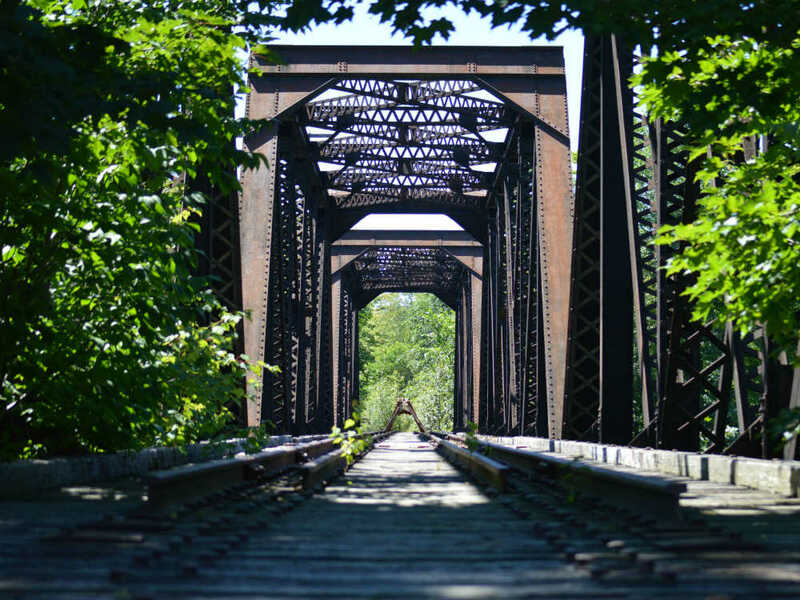 Past that was the high bank of the Carrabassett and more rail, so overgrown we lost our footing more than once as we peered through the brush back over the bridge and ran our fingers over the rusted dates on a switch to the side of the track. We were steadier on our trip back, and bold enough to venture under the bridge, where we found the water wasn’t as scary as it sounded or looked from above, and where Trevor discovered a rope attached to the ties above. I gave him that look and he, eventually, let it go, and hardly laughed at me at all when I halfway fell into the river anyway.